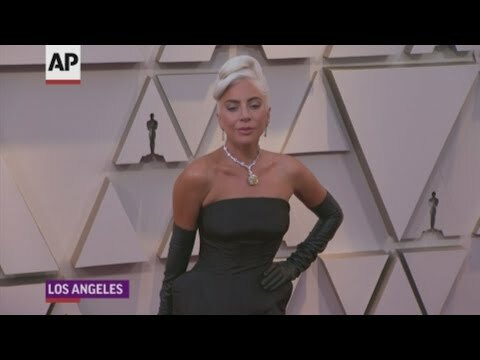 NEW YORK (AP) — Lady Gaga sported the Tiffany Diamond around her neck and Glenn Close wore 40 pounds of gold dress to the Oscars. Charlize Theron rocked a bob in transformative dark brown and Jennifer Lopez was fit for battle in a head-to-toe mirror mosaic on a mighty silver dress. Hollywood’s fashion show Sunday in Los Angeles went technicolor and soft, ruffly and classic. It showed off pink and red, white and black, all in plenty of tulle, chiffon, crepe and velvet. Theron donned Dior in dusty periwinkle, a color called “unexpected” by People’s style and beauty director, Andrea Lavinthal. Regina King “looked so elegant in her perfectly-tailor white gown” by Oscar de la Renta, and Lopez took Lavinthal’s best-dressed spot. “From Lady Gaga debuting Tiffany’s most precious diamond to Charlize Theron dripping herself in Bulgari earrings, necklaces and bracelets, bling is most certainly back,” said Joyann King, executive digital editor for Harper’s Bazaar. Gaga was more Old Hollywood than her the shock-flash on which she built her dressing cred. “She really toned down the theatrics during award season but not at the expense of her style,” said Channing Hargrove, a fashion news writer for the millennial-focused site Refinery29.com. It came in a variety of shades, from a honeysuckle pink lace gown by Jenny Packham worn by declutter guru Marie Kondo (she has a Netflix series) to the tiered confection donned by Kacey Musgraves, by Giambattista Valli Couture. King said Gemma Chan’s voluminous bright pink Valentino Couture dress with a high ruffle neck “stole every fashion editor’s heart.” And, bonus, it had pockets. Julia Roberts wore a draped magenta one-shoulder silk crepe creation by Elie Saab Couture to present the best picture award. Overall, major pink gowns, including Angela Bassett in custom Reem Acra, were showstoppers. Lopez, with Alex Rodriguez at her side, was ready for battle in a long-sleeve silver Tom Ford gown that stood out for its chunky embellishment. “Tom Ford famously only dresses one star every season on the red carpet. When it comes to rocking a mirrored metallic sheath, no one could possibly work the look more elegantly right than Jennifer Lopez,” said People’s Lavinthal. Brie Larson and Emma Stone were also fierce, Larson in silver Celine by Hedi Slimane. It was a sparkly halter look with a high neck, another trend of the evening. The Lopez look also included a high neck. Stone was in burnished Louis Vuitton with structured short sleeves that could have taken flight. Glenn Close may not have won a best actress statuette, but she won the carpet in a gold gown with long sleeves and a long cape by Wes Gordon for Carolina Herrera. Graham’s best in gold was Danai Gurira in textured Brock Collection. She called her gown with black detailing “a beautiful take on a strapless princess look.” Gurira wore “just the right amount of jewels,” including sleep droplet earrings by Fred Leighton. The look, Graham said, was ornate, luxe and elegantly red carpet perfect. Nicholas Hoult wore lopsided lapels with a side sash piece, thanks to Dior Men by Kim Jones. There was color, including Stephan James in red velvet custom Etro and David Oyelowo in custom Etro done in green velvet. And then there was Billy Porter, dressed in a custom tuxedo and a tuxedo ball gown combined, by Christian Siriano. The dudes took risks and they paid off. Chadwick Boseman wore Givenchy Haute Couture, designed by Clare Waight Keller. It was a play on classic tails, with the tail hanging nearly to the ground, in a Japanese design embellished with black and blue beads and sequins. Jason Momoa wore pink Fendi, telling The Associated Press it was likely the last custom look Karl Lagerfeld designed for Fendi before he died last week. “I loved all of the black men who were not afraid to shy away from texture,” Hargrove said. Siriano said on E! that Porter’s dress was pulled together in a week, using the “Pose” actor’s assistant as a fit model. “Billy looked great,” Hargrove said. So did Spike Lee, in purple from head to nearly toe. On his feet were golden custom Air Jordans.